On March 1, 2016, Nextdoor announced that the County of San Diego will be joining relevant Nextdoor Online Community networks to share important information. This includes the Santa Fe Hills Nextdoor network. Two years ago, an effort was made by local residents to encourage the San Diego County Sheriff to join the Nextdoor City Program, but we’re unsure if the Sheriff will be participating. Last year, the San Diego Water Authority joined Nextdoor to mixed reaction. 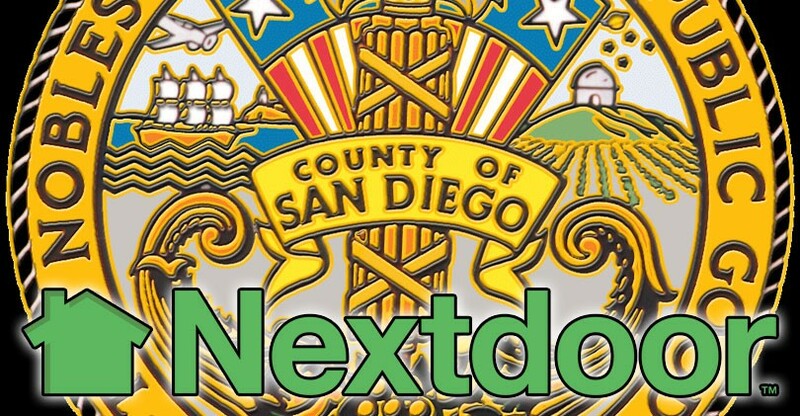 Official Announcement: We are excited to announce that the County of San Diego has shown interest in using Nextdoor to provide important updates and information to neighborhoods in your area. As part of this effort, you may see periodic updates from County of San Diego staff in your neighborhood. The purpose of these updates is to share alerts, news, and other notifications that are relevant to your neighborhood. It’s important to note that County of San Diego staff can only see their own posts and replies to these posts. They will NOT be able to access or view any information that you and your neighbors have shared in your neighborhood. Communicating with County of San Diego staff is entirely voluntary, and you can see more information here. You may choose to unsubscribe from all County of San Diego posts, as explained here. Please visit our Help Center if you have any questions.